Nephrolepis (Nephrolepis exaltata): growing, planting, caring. This indoor fern is perfect for beginners with its pretty long cut out fronds. Nephrolepis is an interior fern originating in the tropics - and not Boston! Nephrolepis are sometimes misnamed as Boston Ferns, but only one of the cultivars is truly called Nephrolepis exaltata Bostoniensis. They are plants grown indoors since the 19th century, and appreciated for their easy maintenance. Nephrolepis have dense fronds that emerge from short rhizomes, forming thick tufts of up to 2 meters in their original habitat. They are pinnate fronds, erect or arched, green, and bearing simple, elongated pinnules. Nephrolepis have dense leaves that emerge from short rhizomes, forming thick clumps up to 2 meters in their original habitat. They are pinnate leaves, erected or arched, green, and bearing simple, elongated leaflets. They are often grown in suspension. Nephrolepis fits pretty well inside our homes and apartments. It will grow at a temperature of 18-22 ° and needs light. However, be carefull: avoid placing it directly behind a window to the south, the direct exposure could burn it. Therefore prefer the proximity of a window facing west to bathe it in brightness. Plant in a mixture of compost, fibrous compost, and sand, in a pot about forty centimeters. You can also install it in suspension. Water until the soil is properly placed around the roots. Use rainwater, or at least non-calcareous water. Do not let the water stagnate in the pot, it blackens the leaves and rots the plant. In growing season water two times a week, then space gradually until watering only once a week in winter. 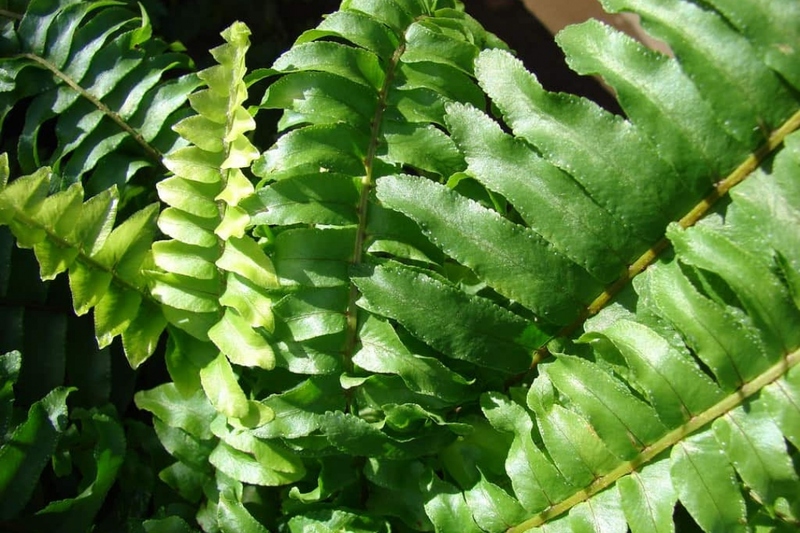 Remember to spray the leaves every time you water during growing season, because this fern appreciates moist climates. At the end of winter every 2 years, repot your plant in a slightly larger pot, adding sand, potting soil and compost. If it is too big to be repotted, then just scrap the surface and replace with a layer of compost. Once or twice a month between April and September, pour some compost juice into the watering water, without excess. The use of chemical fertilizers for indoor plants is also possible. Watch out, if you see your indoor fern rot, it is because it is watered too often: put less water in each watering, or space them a little. Otherwise, mealybugs can be installed on the back of the leaves: to unhook them, use a cotton swab soaked in alcohol.